I hope everyone has lots of fun and gets tons of candy!! Every October me and my wife hold a "Scary Movie Marathon". This year was no different. We try to pick a new movie or show each day that gets us ready for the Halloween season. This year the majority of movies we watched were on Netflix. Here is another short list of some of the films we have watched and what I thought of them. Please don't be upset if I didn't like something you liked, we all have our own opinions and tastes in horror movie cinema. Here comes part 2 of my Halloween movie recap 2017! This movie was watched because of confusion. 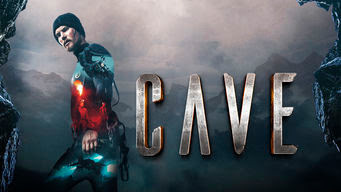 Let me tell you now this is not the movie "The Cave" where Morris Chestnut and Piper Perabo get hunted by monsters while exploring underground! No, this is dubbed foreign film about a guy who wants to kill his best friend so he can get with his friend's wife! A total let down not only because there were no monsters, but because it just wasn't very good. It was boring, slow in some spots and some of the suspenseful moments never really paid off. I do not recommend this one! I had heard a lot of hype around this movie and it was one of the first movies we watched this year. I really do have to say that I was impressed with what was able to be done on such a small budget. The story revolves a round a young boy who is being terrorized by a supernatural being called The Babadook. Things get a little crazy when a book about the monster shows up at the child's house. 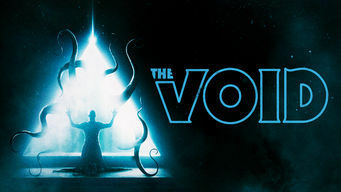 The scares were satisfying and the story was actually pretty solid. I just think it was a little slow in some parts and the ending was not what I expected. Not terrible, just not what how I would have ended it. I say give it a watch, it won't be a waste of your time! I was a little disappointed with this movie. 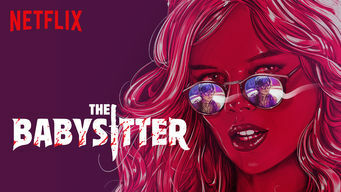 When I found this on Netflix and saw that it starred Jessica Alba & Thomas Jane, I was in! I have been a fan of these actors for a while and to see them together in a supernatural scary flick should have been AWESOME! The story actually had some promise as Alba played a documentarian who brings the lone survivor of a cult murder back to the scene of the crime. The story unfolds as Alba and her team discover some old movie reels that show Jane's cult taking part in some crazy rituals. 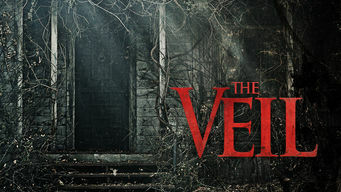 Once again "The Veil" had some great promise, but the final act and ending was a let down. This could have been a good one. 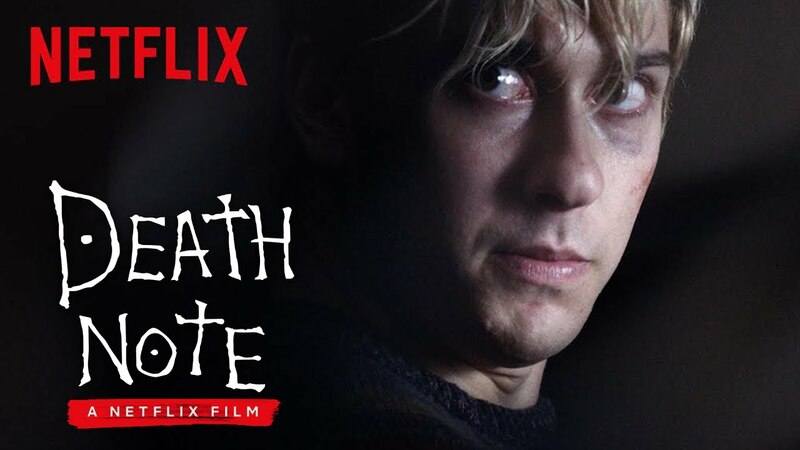 First off I have to say that I have never seen the anime version of "Death Note" so I really have nothing to compare it to. That being said, I actually enjoyed this movie. 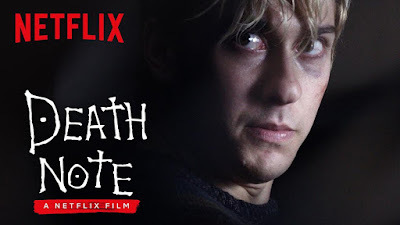 The premise is cool, where a bullied boy named Light Turner discovers a book that can cause death to anyone whose name is written in it. But even when Light attempts to use the book for good a demon named Ryuk changes the game and things start to unravel for our would be hero. The effects were solid, the pace was good and the ending left me wanting to see more. I will definitely check out the anime soon! 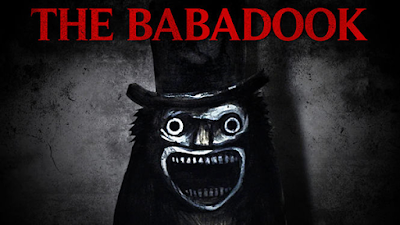 This was another horror movie with a great concept and this time it was carried out competently! Years after the zombie apocalypse, humanity is starting to rebuild the world. One enterprising person has decided to turn a zombie inhabited island into a vacation destination where people can live out their revenge fantasies and hunt these creatures for a small fee. It's like a zombie safari. Things get flipped upside down though when sabotage leads to a high tech security system breach and now the zombies are on the loose! At this point the film kind of becomes a zombie version of Jurassic Park. If you are a fan of the undead genre, I truly recommend this film. The acting is solid and the twist at the end of the film is a pretty sweet payoff. Needless to say, I enjoyed this one! "Trial of Krang," part 3 of 3. 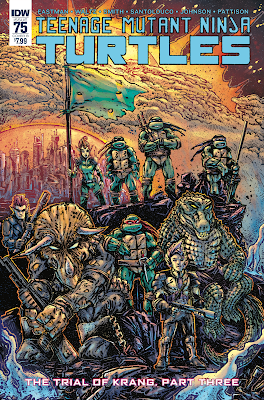 The oversized conclusion to the Turtles' greatest extra-dimensional story arc is here! Both the prosecution and the defense have tricks up their sleeves as testimony gets emotional. Meanwhile, a war rages outside the courtroom as the Malignoid swarm engulfs Planet Neutrino! 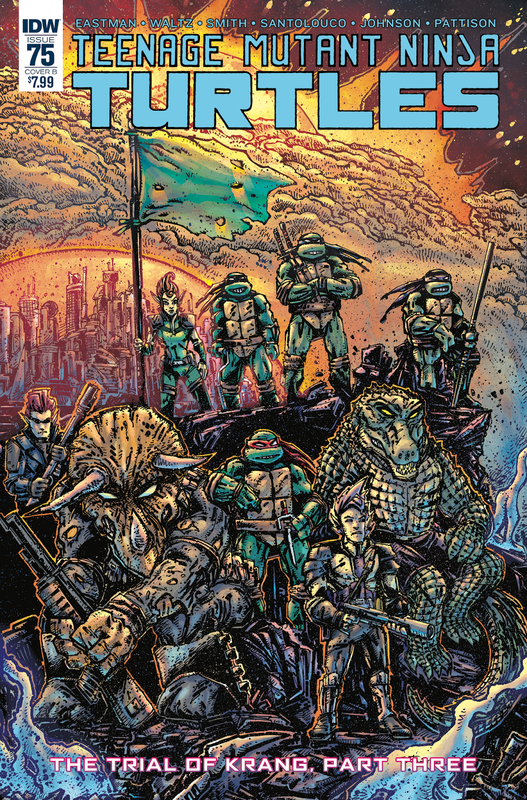 An oversized epic that starts the road to TMNT #100! 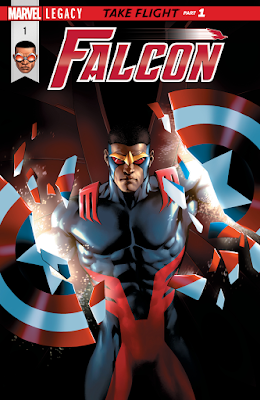 Courtroom drama and extra-dimensional war action all in one issue! Every October me and my wife hold a "Scary Movie Marathon". This year was no different. We try to pick a new movie or show each day that gets us ready for the Halloween season. This year the majority of movies we watched were on Netflix. Here is a short list of some of the films we watched and what I thought of them. Please don't be upset if I didn't like something you liked, we all have our own opinions and tastes in horror movie cinema. The movie starts out with a man escaping from a house where he and a girl were being held captive. He is found on the side of the road by a bored local officer named Carter. Deputy Carter brings the man to a hospital and is followed by some cloaked figures that surround the hospital. That's when the terror comes in! This movie was a crowd funded project, so I tried to give it the benefit of the doubt, but the story went a little crazy towards the end and was kind of hard to follow and understand. I've got to say that I really did enjoy the practical effects and monsters were pretty cool looking. Overall, I came away from this one pretty disappointed. First of all I want to state that I am not a huge fan of Chucky's movies, but I did watch the "Curse of Chucky" last year and enjoyed it. This movie "Cult of Chucky" picks up after the events of Curse which was nice because they didn't have to waste a whole lot of time setting up the characters. The film makers just went straight into the craziness on this one. The story takes place in an asylum where Chucky tries to finish the job he started in the last film. I was not a huge fan of the way Chucky was able to so easily create new versions of himself and transfer his personality into other dolls/people. In my opinion the film was okay and not a total waste of my time. I saw it once and more than likely not again. It's okay if you like gore and want a decent Halloween scare. I watched this movie on a recommendation from a friend at work and was not disappointed. The movie involves the character Will heading back to his home where his ex-wife now lives with her new husband for a dinner party. After the death of their son Will and his wife separated and she hadn't been seen for 2 years. What has she been doing in that time? I did enjoy the suspense of the movie, but I felt the showed their hand a little too early. I knew something was crazy about these people at the party, but what? Were they vampires, werewolves, a cult? I didn't know! But once a video was played at the party it was pretty clear where this film was going. 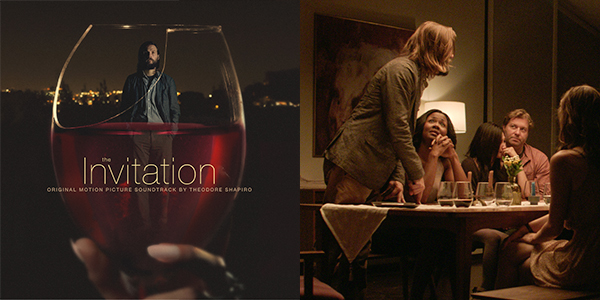 The one thing that I felt was scary about "The Invitation" was that the protagonists in the film were just people. Everyday people with a terrible agenda! I would recommend checking this film out, just to see the twist at the end of the movie! What's the deal with that red light anyway? This was probably my favorite new movie we have watched this season. It's an anthology sort of like "Trick R Treat" where all the stories can be tied together by one single Halloween night. There are ten stories in this anthology and the majority of them are pretty damn good! 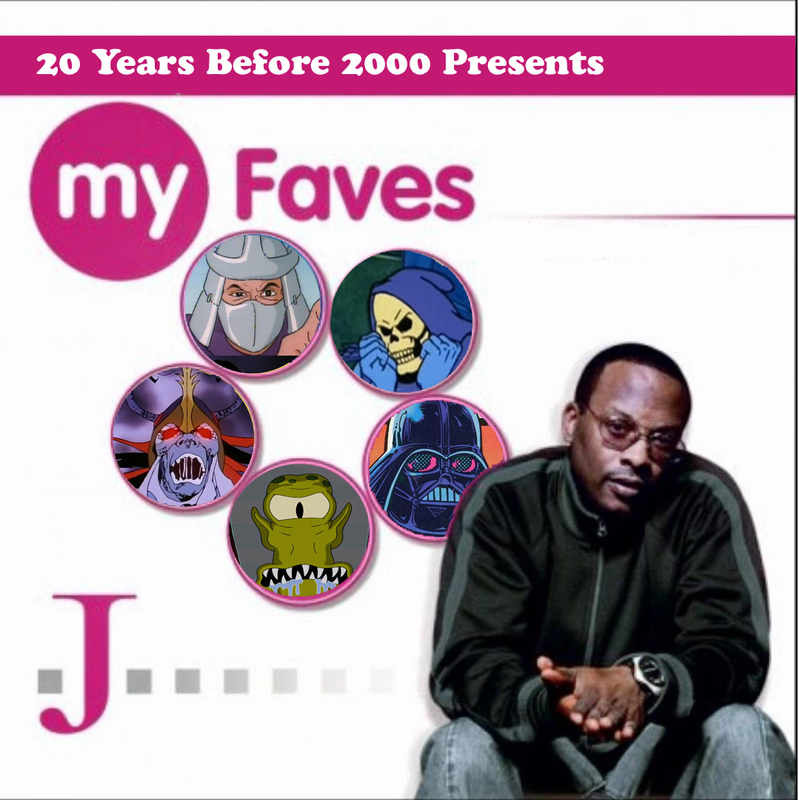 My faves would have to be "This means War", "The Ransom of Rusty Rex" and "Friday The 31st". I highly recommend this film, especially for your Halloween movie marathons! Wow! This movie was a surprise! It starts out so sweet with a young boy, Cole who has a crush on his babysitter, Bee. 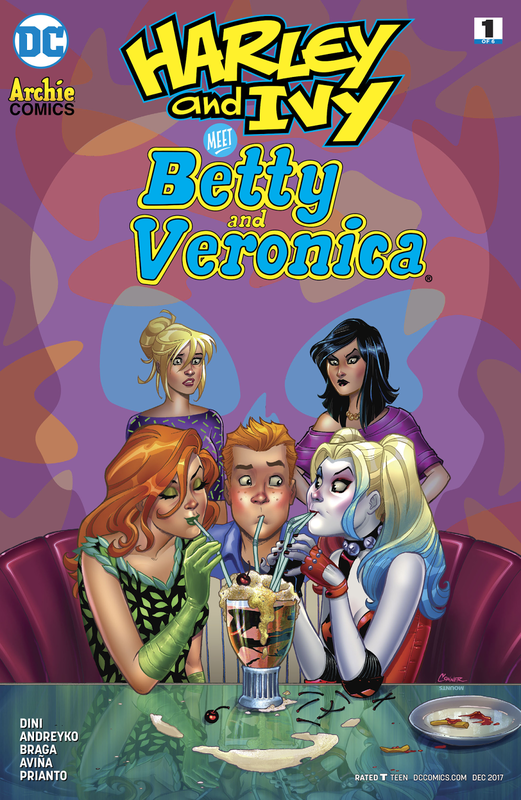 They have lots of fun together when Cole's parents are out of town, but things take a grim turn for the worst when Cole stays up past his bedtime and witnesses the unspeakable acts of Bee and her friends! The friends find out Cole had seen them and The Babysitter becomes a tense game of cat & mouse with some humor sprinkled in just at the right time! My favorite part of the movie is when Cole is caught and about to be murdered when his house starts getting egged. The would be killer has a moment of sympathy for the boy and gives him a pep talk on how to confront his bully! 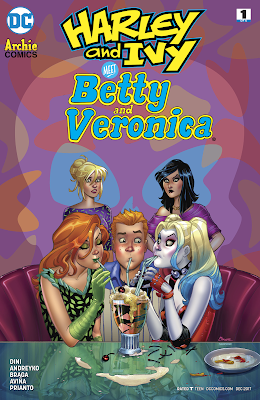 The humor and gore are mixed so well that you really don't notice the plot holes or question the characters motives. It was a fun watch and I would recommend it! I have a fairly big collection of loose figures from the 80s & 90s. I would like to share a few of my faves with you at this time and since it's the Halloween season, I'm gonna make this one an ALL BAD GUYS EDITION! Here we go! 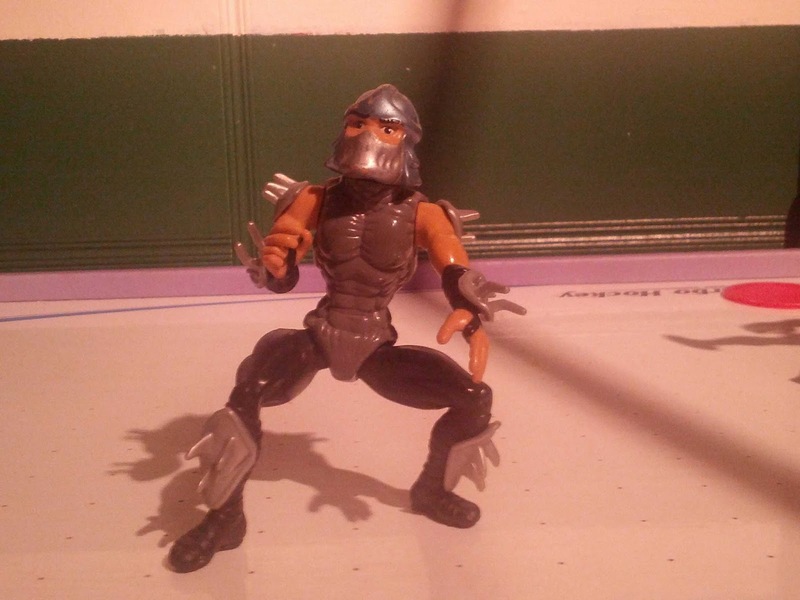 I never had this version of the Shredder as a kid, but always wanted him. He was released around the time I stopped buying toys and hit puberty. This version of Shredder is what we should have got the first time around instead of that purple and dark blue suited imposter that was released in 1988. I just wish he wasn't so damn hard to pose! 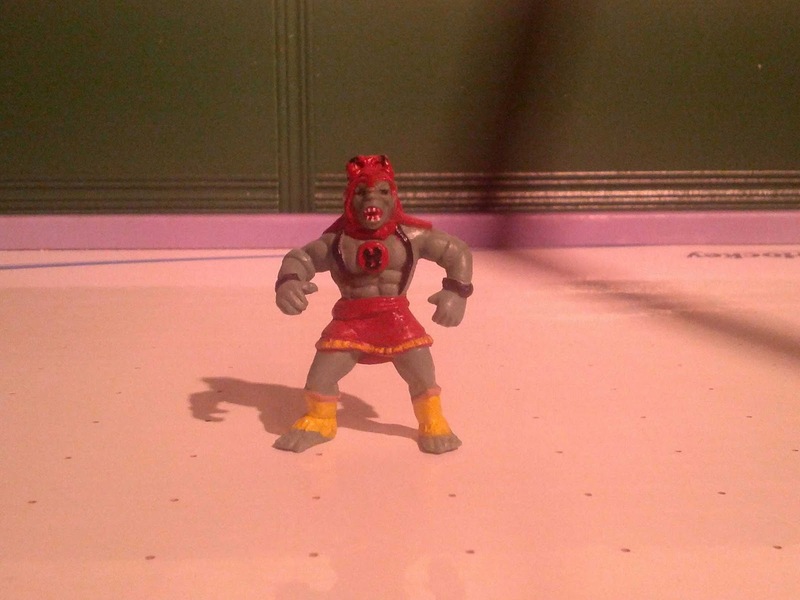 These mini versions of the Thundercats characters were a favorite of me and my brother. 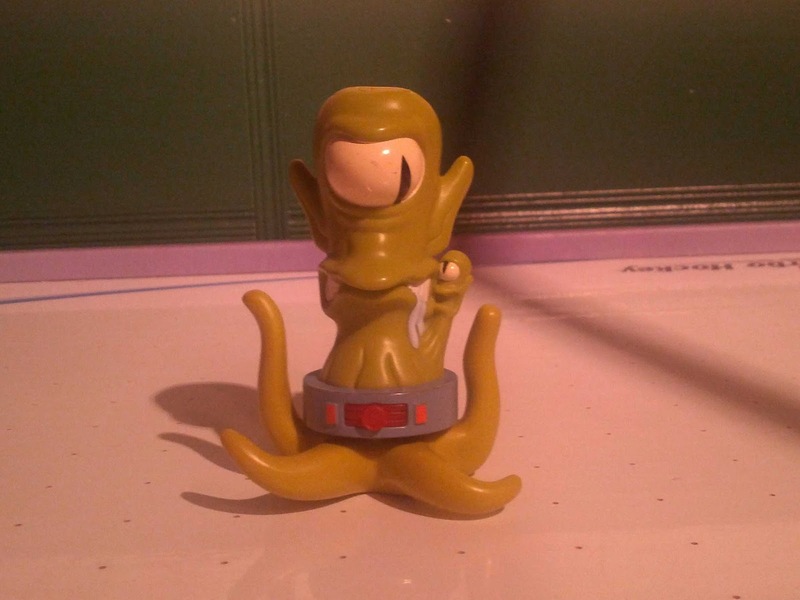 They had no articulation, but they were travel size and always made the shopping trips with our Mom all that more epic and exciting! I have a soft spot for this Treehouse of Horror series from Burger King. They were released around the time my twins were born. Myself and the wife had been stuck at the hospital for a few days and my wife's parents were cool enough to watch our oldest daughter. She was going to become a big sister, but wasn't able to visit the hospital yet so I still wanted to keep her involved and do something special. I picked her up from the house one day and took her to Burger King and we got some Kids Meals that had these toys inside! Good memories. I don't have too much to say about this figure except that I picked up this Titanium Darth on clearance while I was working at Target. 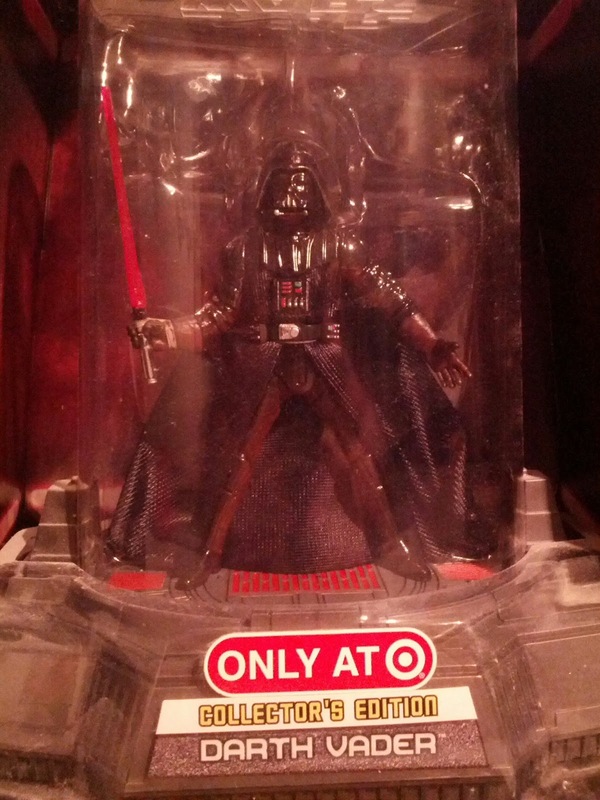 I'm a big Star Wars fan and Mr. Vader is my favorite character. How could I pass up this toy? I absolutely loved this guy as a kid! To this day I still feel giddy every time I roll back his battle damaged chest plate and then punch it to reveal dents and scratches! It really makes me feel like the most powerful man in the universe! 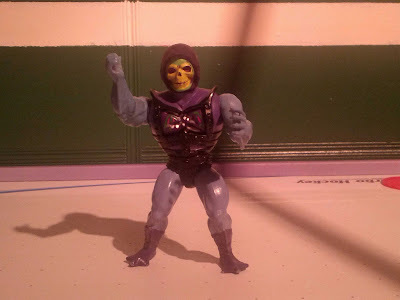 This version of Skeletor is great, but he still comes in at a close second to my number one pick, Dragon Blaster Skeletor. Did you enjoy this post? If you missed the first few parts of the 20 Years Before 2000 "My Faves: Figure Collection" series you can view them at the links below! Hang on to your diapies, babies! 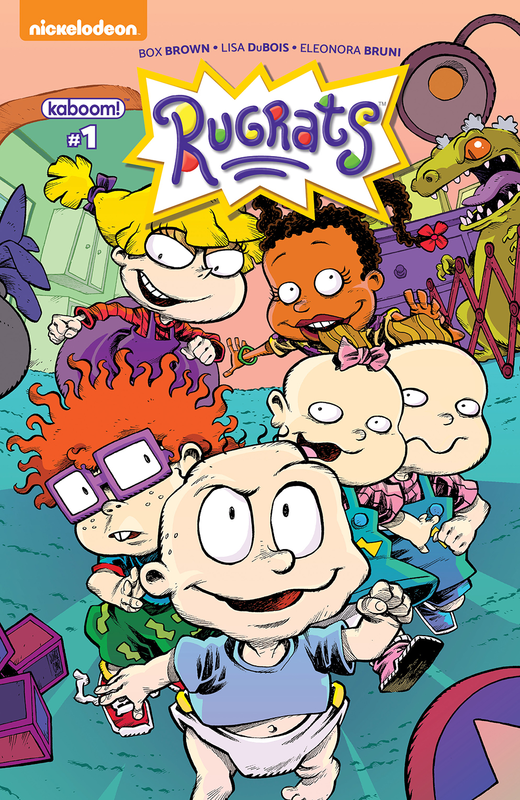 We're teaming up with Nickelodeon for all-new Rugrats adventures with the most intrepid toddlers to ever bust out of a playpen! 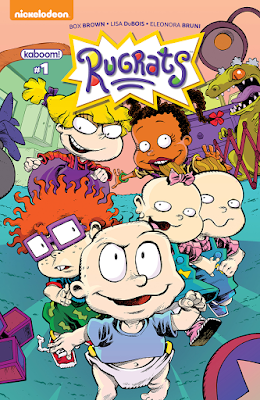 Tommy, Chucky, Phil and Lil have noticed something-they are being watched. Somehow their parents can see every little thing that they can do. They're going to have to find a way to have fun while avoiding the electronic eyes of the babycam! 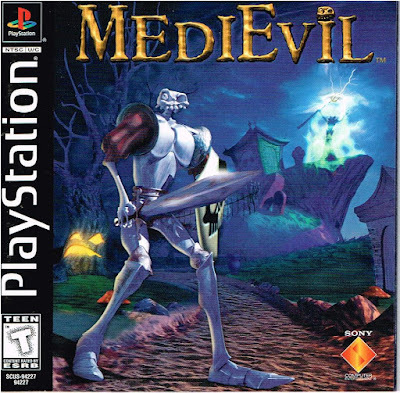 In 1998 Sony Computer Entertainment dropped the action/adventure game "MediEvil" onto us! In the game you play as Sir Daniel Fortesque, a medieval knight who was wrongly credited with defeating Zarok and his undead army! 100 years later Zarok has returned and Sir Daniel has been resurrected by accident. To prove he belongs next to the great warriors of his time in the hall of heroes, it is up to this jawless, single eyed soldier to save the land of Gallowmere! 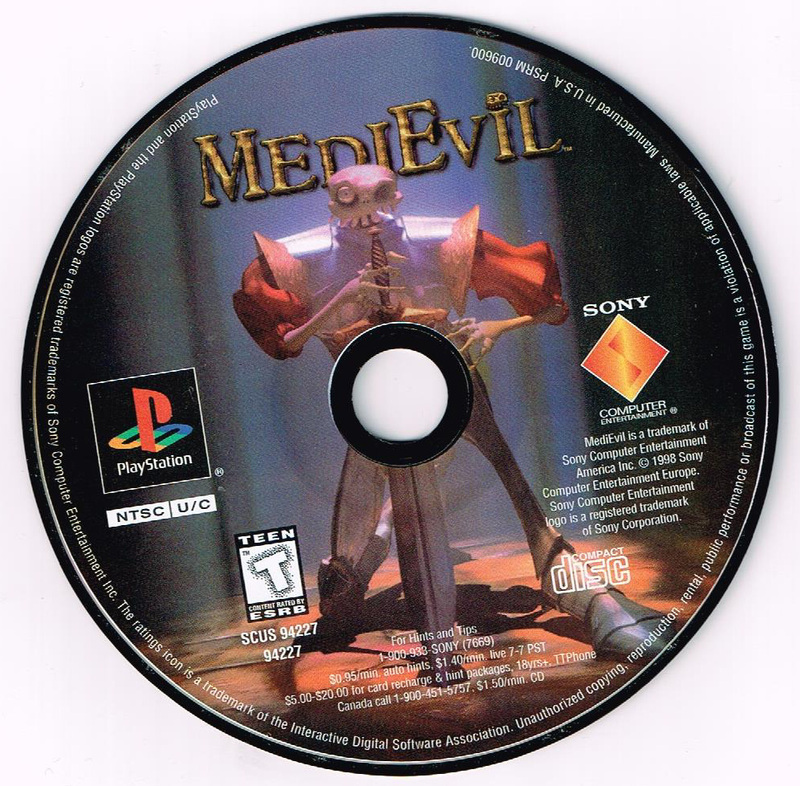 Me and my brothers got this game as a Christmas present and was one of the first PlayStation games we ever owned! From the start I was hooked. The story was cool, the graphics were outstanding for the time and the characters & settings were artistic and clever. It's really a shame that despite positive reviews, we only got one proper sequel to this fun and imaginative game! 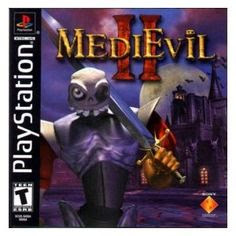 In 2000 MediEvil 2 was released again by Sony and it picks up 500 years after the first installment with Sir Daniel in London attempting to stop sorcerer Lord Palethorn and Jack the Ripper's plans to revive the dead. I have never played this game, actually I never knew it existed until I started writing this post! But now I am on the hunt for a copy! According to reviews, it plays and looks pretty much the same as the original. Seriously though, who could pass up an opportunity to become an undead warrior who fights creatures of the night on his way to thwart the plans of Jack The Ripper! It sounds like a blast, but nothing can replace those teenage memories of playing this game full of ghouls and demons on Christmas morning with my brothers...oh I mean brother, my youngest sibling was so scared of the game that he couldn't nor be around anyone who was playing the game! 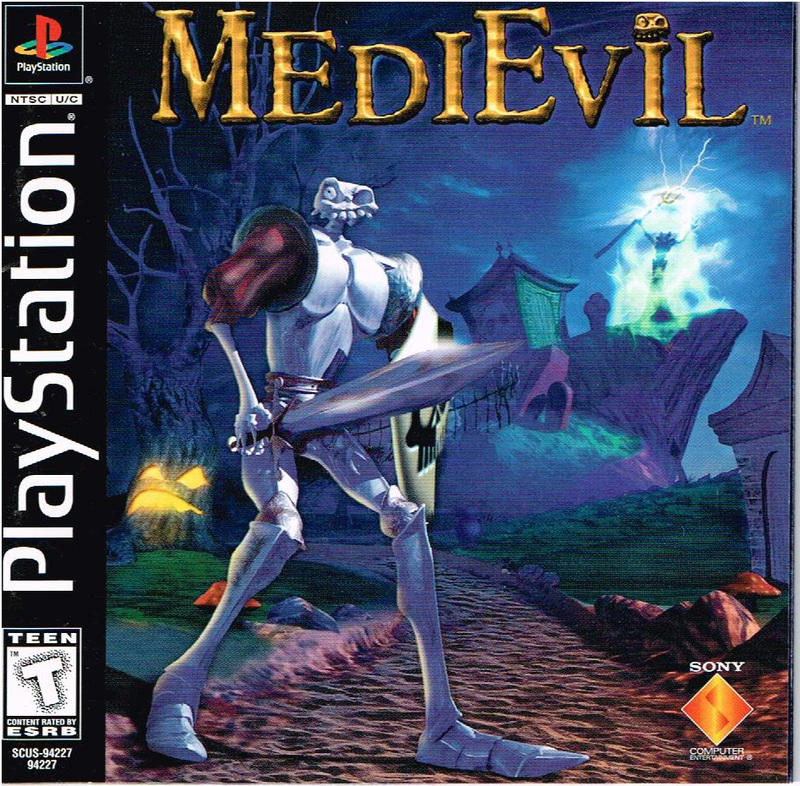 Sony really needs to go back and take a look at this PS1 classic. Could you imagine this game on the PS4? That would be insane! Now enjoy this MediEvil commercial from the 1998 holiday season! Halloween Cinematic Favorites: Return of the Living Dead! Last year my wife and myself went to the Magic City Monster Con where Linnea Quigley aka Trash from Return of the Living Dead would be making an appearance! We met her and she was a really nice person. I wrote all about it in a past post that you can read by clicking HERE. Seeing her reminded me of my childhood trauma of witnessing the Tar-man eat a punker's brain. I'm pretty sure I was around 10 years old at the time! Well, it had been years since I had seen the movie and my wife had never seen it at all! 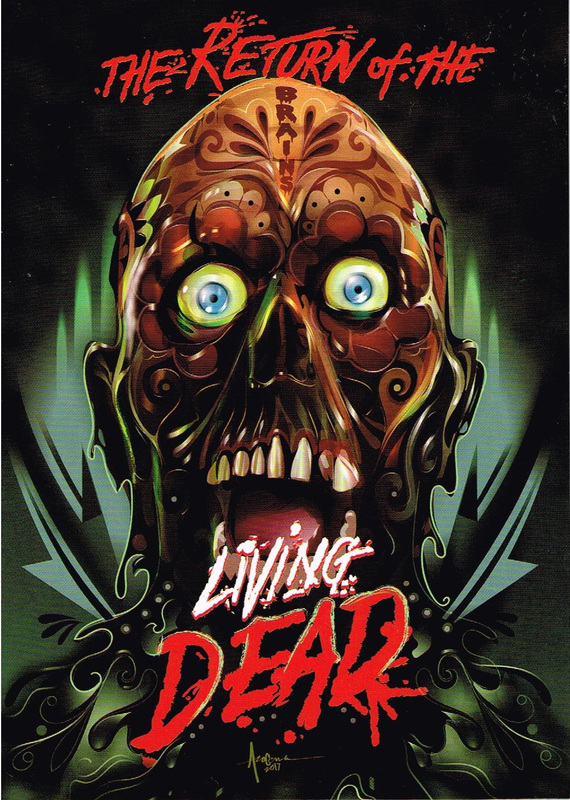 I was on the hunt to find a copy of Return of the Living Dead! I had heard that it would be re-released along with a slew of other great horror movies. Then I found it at Wal-Mart for the amazingly low price of $5! I love the new special edition packaging these movies are sporting. They have horror icons from Chucky to Carrie done up in a sort of "Day of the Dead" style. Very cool! We watched the movie this past weekend as part of our Halloween movie fest, and it had more humor than I remembered. I mean how could you not chuckle when the zombie asks for them to send more paramedics...for them to eat! And damn, that Tar-Man still scares the crap out of me! I guess that's the point of these movies to have fun and enjoy the ride! 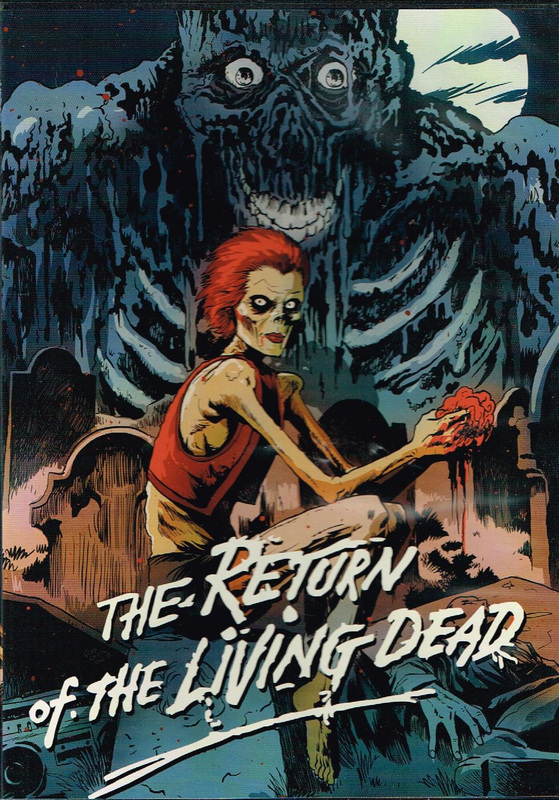 Here are 3 moments that I loved from Return of the Living Dead! These clips are not for younger viewers. Viewer discretion is advised! After two bumbling medical supply warehouse workers named Freddy & Frank accidentally open a military canister containing a reanimated corpse, all of the dead things in their office start coming to life! This includes cadavers for medical research, 1/2 dogs used for vet studies and even pinned butterflies start flapping their wings! It's crazy and funny watching these two try and contain the latest zombie outbreak especially when they smack a reanimated dog with a crutch! UGH! This is another scene that terrified me as a kid! While Scuz, one of the punks in the film is being attacked by a zombie, the rest of the team manages to pull him back through a busted window and into their mortuary sanctuary. Unfortunately the zombie that was attacking him is pulled in also. Ernie, the guy who runs the mortuary thinks it would be a good idea to strap the zombie down and ask it a few questions. This is where I learned that eating brains eases the pain of being dead! The damn Tar-Man! The actor who portrayed the Tar-man did an amazing job with the body movements and really gave the feeling that this guy was ready to fall apart at any moment, but that wouldn't stop him from ingesting some brains first! 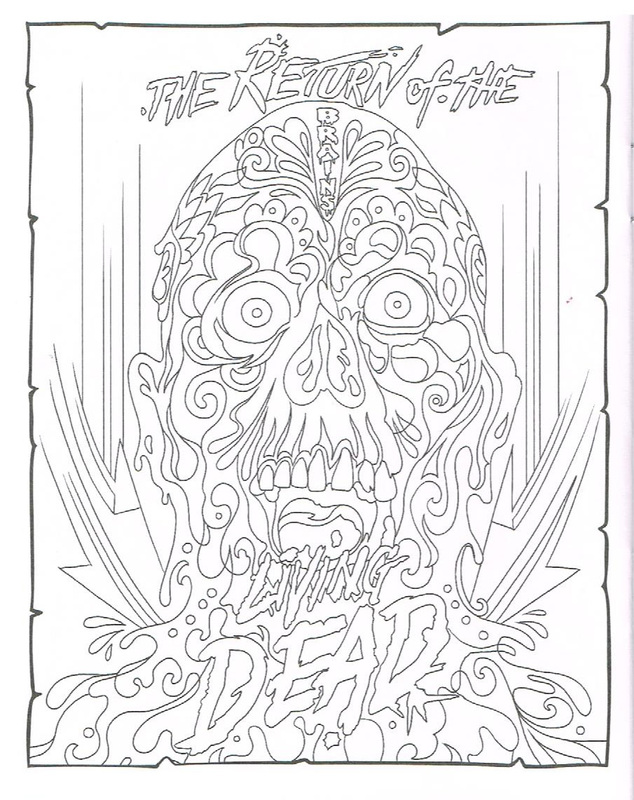 Well, those are some of my favorite moments from Return of the Living Dead. If you have never seen this movie I highly recommend it for the Halloween season. Now that I own a copy, it will be a staple of my fall viewing for years to come! 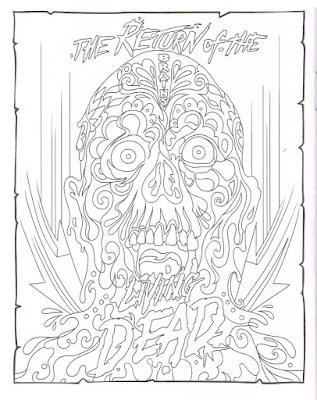 Now take some time and enjoy this coloring page of the cover art!